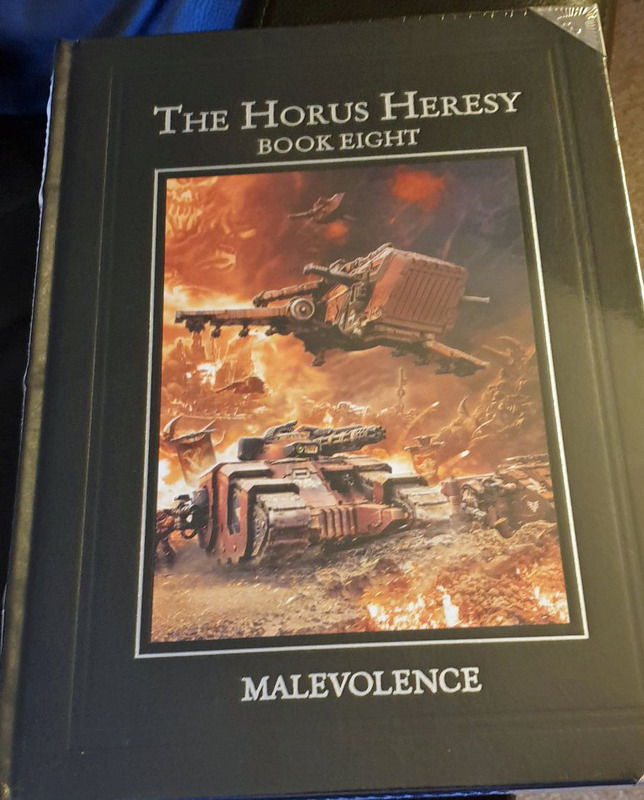 Recalcitrant Daze: Horus Heresy Book 8 - Malevolence - Daemons of the Ruinstorm. 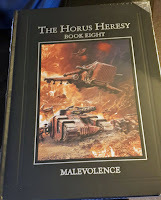 At the Horus Heresy Weekender I pre-ordered Malevolence and a week ago it arrived. While many will turn to the Blood Angels or White Scars sections first, for me the highlight was going to be the Daemon list. I had a feeling I would not be able to resist starting something. As a way to get some content up on the blog and also to allow me to get a grip with the list myself I thought I would do an article giving an overview. Daemons of the Ruinstorm – Army List Overview. A brief introduction to the Daemons of the Ruinstorm and their place in the Horus Heresy. Guidance and Army Wide Rules. Treated as Agents of the Warmaster for purposes of the allies chart. The army is a blank canvas allowing you to interpret the unit entries as you want, but due to this choices and options must be made clear on the models. Lesser Daemons 32mm (e.g Bloodletter, Plaguebearer equivalents). Shrikes 60mm (this is a flying monstrous creature with an appropriate base size). Behemoth 170 x 105 oval base (if you want to use some of the Forge World large models in 30K here is your chance, large monstrous creature but not quite Gargantuan size). Daemon of the Ruinstorm – almost all units in the army list have this. It gives an invulnerable save and grants them all Fear. While automatically passing some tests (e.g. Pinning) if they fail a Morale check they do not fall back but instead roll on the Perils of the Warp table. Perils of the Warp table – just for these guys is a new table. You may take casualties, and possibly penalties to stats as well…or maybe stat bonuses. The Warp is fickle after all. Parting the Veil – Ruinstorm units do not start on the table (except for one unit – see later). Instead markers are used to represent Warp Rifts, and it is from these the Daemons emerge. Some unit entries may be brought through on turn 1 without a need for a reserve roll (those with the ‘Vanguard of Hell’ rule). Otherwise units are in reserve and roll to see if they can arrive – though the reserve rolls is never modified, e.g. by other army special rules. The 5” markers are placed after set-up, but before infiltrators are placed. Tides of Madness – The power of Ruinstorm Daemons is not consistent. When they first enter real-space they are at their peak, but as time passes their power fades. The game turn is used to determine this. While they get stat bonuses early on, later they get negatives. Now, in the book Emanations of Horror come before Aetheric Dominions. However, I am going to talk about these first. When I first looked at the army list my initial response was that it reminded me of the IA13 Renegades list (see here), having ways of theming a force and unit options to differentiate and vary units from each other. The Aetheric Dominions (or just Dominions from now on) are the first step in theming your Deamons of the Ruinstorm force. We have six presented in the book, four of these take you in the direction of one of the Big Four Chaos Gods, one is for when you love a multitude of powers while the sixth is a surprise entry. Each option brings themed army wide rules, Warlord Traits, allows access to one or more of the restricted Emanations of Horror (see below) and give an optional Primary Objective. Crimson Fury – You want blood? You like skulls? This is the one for you. Units gain Rage or Rampage, depending on the unit type. You get access to the Brass Collar Emanation and a Warlord Trait table with appropriate entries. You can choose to change the Primary Objective to one where you gain VP’s for units (friend or foe) destroyed in bloody ways. Creeping Scourge – For lovers of jolly putrescent grandfatherly figureheads. Units have Feel No Pain or It Will Not Die, but movement is affected. Access to the Miasma of Rot Emanation and as above a Warlord Trait table you can use. Alternative optional Primary Objective revolves around the Warp Rifts and keeping them clear of the enemy. Lurid Onslaught – For those who enjoy an assault of the senses. Hit and Run for all but cover saves are restricted. Stupefying Musk Emanation is available and again a new Warlord Trait table. Primary Objective can be swapped for getting VP’s for enemy units who fail Morale checks (with a possible sting in the tail however). Maddening Swarms – So, you like weird things and powers unexplained? Well fill your boots. Each unit can take an additional Emanation bringing a huge amount of variety to your force. However, if you don’t use a psychic power when you have access to them you may become a cropper later on, nothing is for granted when you are dealing with the Warp. You can take the Warp Scions Emanation and use the themed Warlord Trait table. Primary Objectives can be exchanged for gaining VP’s for units destroyed or fleeing from a result of Psychic Powers. Resplendent Terror – For when you want to revel in Chaos as a whole using a mixed force, reminiscent of a regular 40K Daemon force with representatives of multiple powers. You do not get a Warlord Trait table, but you do get to select from all the Emanations of Horror. You can change your Primary Objective to gaining VP’s for enemy units destroyed of fleeing. The Emanations of Horror are unit upgrades. Almost all units can select from these options, though not all options are available to all units. Each Emanation has three points value brackets with each unit in the army falling into one of them. For example, the Lesser Daemons fall into Bracket One paying the smallest amount for an Emanation, ranging from 1 to 5 points per model. Meanwhile a Behemoth falls into Bracket Three and pay between 5 to 25 points per Emanation. In total there are 20 Emanations to choose from. These range from offensive options giving the unit Rending (Crushing Claws) or ranged attacks (Bone Shard Harpoon) or psychic attacks (Flaming Ichor), to unit upgrades including being made jump pack infantry (Daemonic Wings) or ignoring Initiative penalties for charging through difficult terrain (Ephemeral Terror). These open up a huge array of options, especially when you consider you can take more than one on a unit. Combined with a suitable Dominion you can recreate much of the flavour of a mono God Daemon build. For example, taking the Dominion of Crimson Fury and then upgrading your units with Brass Collars, Warp-scaled Hide, Molten Blood, Horned Crown and Crushing Claws will bring a red-tinged tear to any Khorne worshipper. The modelling and conversion opportunities this can bring are endless. Units can take the same Emanation but modelled differently, as long as you are clear what has been taken anything goes. A must for your force I feel, unless you take one of the special character HQ options. A monstrous creature with the option of either taking a bodyguard of Brutes or being made a flying monstrous creature. With the option to take up to three Emanations you can tailor the Lord to be whatever you want and with the Vanguard of Hell rule he leads from the front. The beast from Signus we all love. With a points value the equal of most Primarchs this guy is a beast and a half. However as any force he leads must have the Crimson Fury Dominion it does limit your options. But, what a guy (oh, he really doesn’t like Sanguinius). On a par with Samus in points but can only be taken in a themed force limiting your options. Unsurprisingly this is a Nurgle inspired Creeping Scourge Dominion. Cor’bax is another leader lacking the Vanguard rule which may put some off. Note, the rules for Samus Unbound & Cor’bax Unbound are different to their previously released rules – the original rules still stand for use in non-Ruinstorm forces. The equivalent of a Herald. With up to three Emanations you can give these a lot of character and make them quite dangerous to face. Also comes with a selection of ‘Preferred Enemy’ options which you can select from before each game. Based on 50mm bases these guys are a step up from Ogryn and with a base points value significantly more than a Terminator they can bring the pain, and that’s before you pick up to two Emanations for them. With the Vanguard of Hell rule these can be on the table right from the start. With a minimum unit size of three they won’t break the bank, but you can go all in and take the maximum of six. Being the only Elite unit in the force there is a potential of 18 these buggers coming on turn 1. Your rank and file grunts taken in units of 5 to 20. Think Bloodletters etc, but with two wounds each! While they start cheap you can take up to three Emanations, so big units will start to rack up the points. You can turn units into a brotherhood of psykers or make them jump troops or assault specialists. The fact is you could have a huge variety of units in your army even if you only took Lesser Daemons. More powerful than Lesser Daemon, with higher strength, toughness and wounds. But only the two Emanations can be selected. With three to ten in a unit this could be a powerful group, being a Troops choice you can fill up on these as your core and then add even bigger Daemons around them. Proto-Nurglings. Enough said. One emanation only but then they are a swarm and you’ll almost certainly be taking them to do what swarms do. Namely swarm things and be a pest. The only unit choice which does not have the ‘Daemons of the Ruinstorm’ rule and who does not appear using the Warp Rifts. As such they do give you an option for units starting on the board – though as they are Support Units they won’t count as your obligatory choices. They start as Auxillary possessed, but can be upgraded to Legionaries. They give you some easy ranged weapon options in your army, as well as having some assault upgrades (though I would stick to the Daemons to do that). A nice sacrificial option that earns no one any VP’s if they are destroyed. Five to ten models in the unit. The stats are the same as the lesser daemons, except for an additional attack. They have the cavalry rule with the option of two Emanations. So with choices they could be Khorne Dogs or Slaanesh Horses. I am definitely looking at options for these, kitbashing kits to give me a fast assault unit. Same points as a Greater Daemon but with only two Emanations. They can enter play through a Warp Rift Gliding or Swooping – unfortunately they do not have the Vanguard rule so can’t come bombing in on the first turn. A range of possible kits to use here even before you considering converting or kitbashing. Based on a 100mm base this Monstrous creature can be taken in units of up to three and the unit can take three Emanations. These give you some hard hitting, hard to kill beasts that can rampage amongst the enemy, however with only 4 wounds they aren’t immortal – though your Emanation selections may offset this. The real big guys, three times the base cost of the Beast above, with the guide giving a 160mm base for him. With 10 wounds and high Toughness and a rule to make them even harder to kill these are going to be a pain to face. Basically the four big Greater Daemons from Forge World. They have their own range of Emanations to select from, of which they can take up to three. You can recreate the Forge World models or come up with your own version. Unsurprisingly damn hard to kill and will put out a huge amount of pain. An update to the Daemonology psychic power covering the Daemons of the Ruinstorm. It allows units to be summoned, but they are a less powerful version than their unbound brethren. While the summoned unit can include Emanations, they are limited to only a single choice and will not get many of the other benefits Unbound Daemons have. Summoning (Primaris Power) – allowing a single Lesser Daemon unit to be summoned. Possession – Greater Daemon or Shrike is summoned for the loss of the psyker/psykers. Nice, now I know that I can bring warp cult+daemons in the signus prime campaign, time to muster the fell legions of Chaos!